Thomas Jefferson was born in Albemarle County, Virginia on April 12, 1743. Little is known about his mother. His father, Peter Jefferson, was a prosperous farmer, surveyor, and land speculator. When Thomas was 2 years old his father moved the family from the family farm called Shadwell to a plantation that was owned by his friend William Randolph. Peter did very well financially, and when he died he left his widow, 6 daughters, and 2 sons with land, slaves, and livestock. 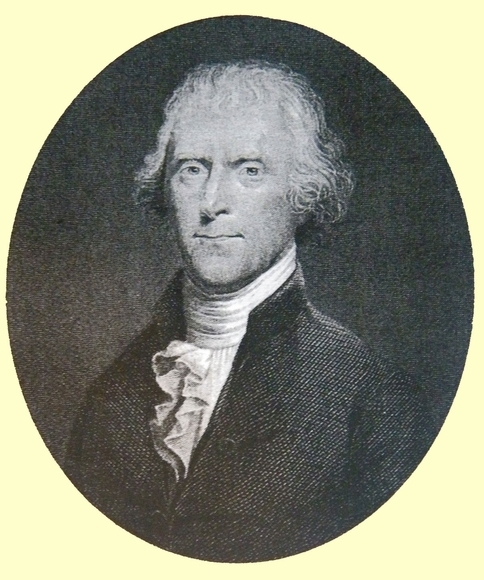 Thomas Jefferson was taught Greek and Latin by a local schoolmaster. He then attended the College of William and Mary, in Williamsburg in 1759. Away at college, Thomas spend most of his time reading and playing the violin. After graduating he studied law under George Wythe. Unfortunately, he wasn't a very good public speaker. In 1768, he started construction on land that he had inherited from his father. He would soon begin calling it Monticello. A year later, Thomas won a seat in Virginia's House of Burgess. Jefferson was chosen as an alternative to congressional delegate Peyton Randolph. However, Peyton soon chose to stay in Virginia, and Jefferson headed for the new capital of Philadelphia. Thomas Jefferson was 32 years old, freckled, and an imposing 6' 2” tall. He was known for his intellect, and was considered an excellent writer. At the same time Thomas Jefferson was fortunate to have wealth and social status. In June of 1776, Congress appointed him to a committee to write the “Declaration of the Causes and Necessity for Taking Up Arms.” Jefferson borrowed extensively from philosopher John Lock and his own writings entitled the “Summary View.” The document would soon become known as the Declaration of Independence. Jefferson was against government oppression. It took him 15 days to write the document that would soon become the foundation of the new government. Congress would eventually delete about 25% of what Jefferson had written. However, they kept everything that asserted that human rights came from nature and that those rights preceded government, and that it was the governments first duty to protect those rights. Jefferson served in Congress until September until September 1776, when he returned to his estate in Monticello. Thomas Jefferson succeeded Benjamin Franklin as the Minister of France in 1785. At this time, his servant's daughter, 16 year old Sally Hemings was living with him. Sally was almost white in appearance. They would spend 4 largely uneventful years in France, with Sally giving birth to a son soon after their return. In 1790, President George Washington appointed him Secretary of the State. Almost immediately Jefferson was drawn into conflicts with Alexander Hamilton. Jefferson believed in small government, while Hamilton believed in expansive government. Soon two political parties formed: the Republicans that were organized by Jefferson and James Madison, and the Federalist who were led by Hamilton. Jefferson would run for the presidency in 1801, and tie with Aaron Burr. The House of Representatives broke the tie and elected him. He would govern simply. His purchase of Louisiana was his greatest achievement. At the time, many Americans relied on the Mississippi River, and when Napoleon Bonaparte acquired the territory from Spain, Jefferson knew he needed to act. Jefferson increased the size of the United States by 140%, for a purchase price of only 15 million dollars. Thomas Jefferson and John Adams died on the same day, July 4, 1826.